One of the main things that struck me about Copic’s multiliner pens is how light they are. Whilst I think the Sakura Microns are slightly heavier and feel expensive, Multiliner Copics are light, unassuming, and free of bells and whistles when it comes to the pen body. Lids go on and off easily, attaching to the back with no fuss. They’re still a sturdy pen, and thank heavens: the inner tube doesn’t rattle around! Amazing how much of a difference that makes when you spend a lot of time writing by hand. Ink-wise I have nothing really to comment on, perhaps except the ink may be a little lighter in tone to the Microns, however that would be splitting hairs. My biggest beef with the Copics is that the nib didn’t last as long as I had hoped. Like its Micron competition, the nib tip went flat relatively quickly with use, and whilst still perfectly functional on it’s end, it does make it frustrating to use at an angle. Impressive though, are the sizes that Copics go to. 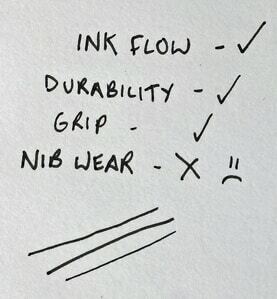 If you’re an artist looking for fine nibbed pens to do intricate art with, look no further. 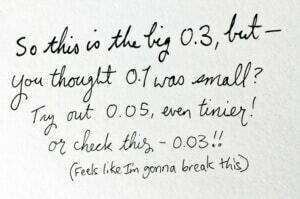 These pens go beyond tiny, with a microscopic 0.03 size that looks like a hair line. The level of detail this pen could achieve in the right hands I imagine would be stupendous. Overall, I was quite pleased with my Copic Multiliner experience. Whilst I personally prefer Microns for bulk writing, I will definitely be using Copics for artwork in the future.